Johnson Machine Works was awarded the fabrication of the jet flow valve by Gracon Corporation on July 7th, 2003. The jet flow valve was fabricated, painted and installed, and is currently in good working condition at the project site. The orginal period of performance was 12 months. Work began in July of 2003 and was completed ahead of schedule in May of 2004. The work involved modification and upgrade of the existing river outlet works for Angostura Dam. The jet flow valve is a small high pressure slide gate. The gate itself was over designed for more universal applications. The plans noted a design head of 250 feet; actual pressure on the gate is only 70 feet. Because of this overdesign, the Bureau of Reclamation (BOR) can use the gate in other locations. 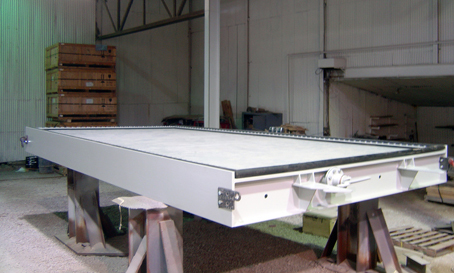 The upstream and downstream gate bodies were fabricated from A36 steel with stiffener plates. The gate leaf had a stainless steel skin plate with a carbon steel frame. The gate height is 4'-3" and the width is 6'-7". 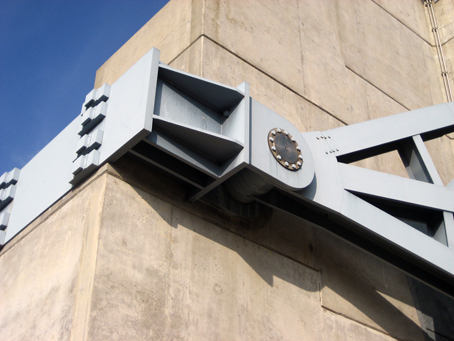 Our customer was Gracon Corporation from Loveland, CO.
Johnson Machine Works was awarded the contract for the replacement of two (2) miter gate leaves for Bankhead Lock and Dam by Herry Pepper and Associates of Jacksonville, FL, on April 25, 2002. Work was completed in August of 2004. The project was for the fabrication of a miter gate to replace an existing gate that had been damaged. 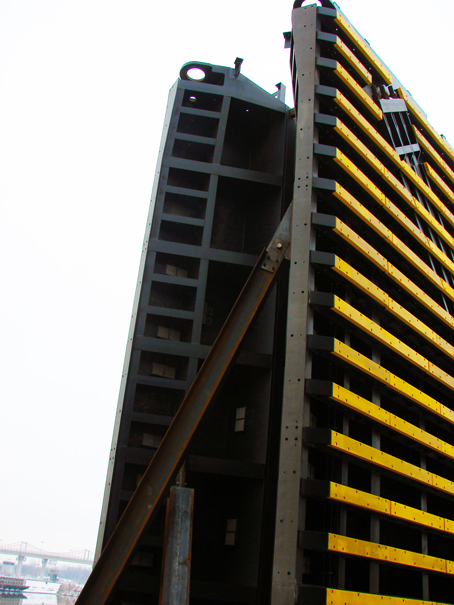 Beyond the normal scope of detailing, fabrication, painting, and delivery we also provided engineering and fabrication of new lifting plates, barge platform design, and barge cradle used during the lifting/setting process. The gate leaves were approximately 89’ tall and 62’ wide. The project called for complicated fabrication during sub-assembly as well as fnal assembly of the gates. Precision machining work was required on all contact blocks, pintle ball components, and miter gate anchorages. Along with the receipt of a safety award as well as a letter of commendationfrom the Mobile District Corp, Johnson Machine Works also developed a patent associated with a redesign of the thrust plate assembly. The Patent No. US 7,037,039 B1 was awarded on May 2nd, 2006. Johnson Machine Works was awarded the fabrication of (2) miter gates for Marmet Locks and Dam by a joint venture Kokosing/Fru-con (K/F), LLC on August 21st, 2002. The existing lock chamber was too small, so a new lock chamber was constructed and extended to allow for larger tow lockages. Along with this new lock chamber new miter gates were required. 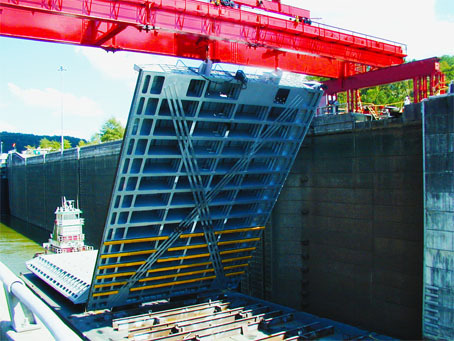 The project required both upper and lower lock gates with two leaves per gate. Each of the upper gate leaves weighed roughly 80 tons while each of the lower gate leaves weighed nearly 180 tons each. The fabrication, albeit complicated, was fairly typical for miter gates. 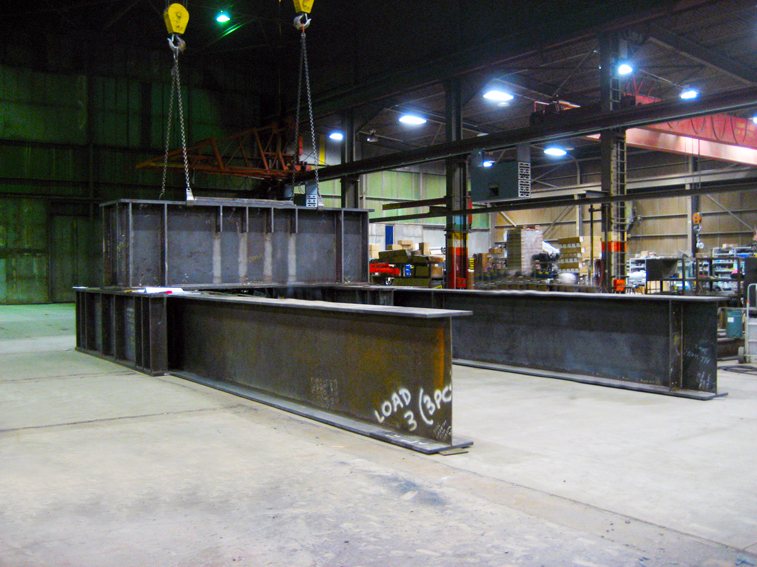 Individual girders were constructed in our shops. The girders were arranged in sub-assemblies with a variety of diaphragms, stiffeners, and intercostals added. Then the sub-assemblies were brought together in a fnal assembly, inspected by the general contractor and the Corp of Engineers, then disassembled and shipped to the jobsite. 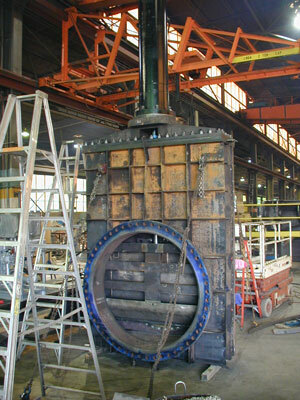 Johnson Machine Works was awarded the contract for fabrication and delivery of a dam bulkhead and lifting beam by Ballard Diving and Salvage on April, 2010. With a projected finish date of October 2010, this project is on track to finish on schedule or earlier. The bulkhead is 10’ wide by 20’ high and weigh in at a approximately 14,000 lbs. A great amount of attention was giving for this project, for the nature of the intended use and workload. The bulkhead was also painted with a zinc primer and two top coats of epoxy. 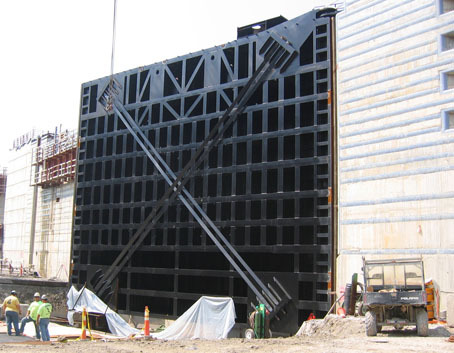 Johnson Machine Works was awarded the contract for the design, fabrication, and delivery of two (2) bulkhead gates located on Swan Island, Portland, Oregon. The gates were 13’ x 16’ x 2’ thick, and incorporated 720 linear feet of stainless steel guides. The gates were designed by Johnson Machine Works to travel down a 120’ shaft to close 14’ diameter storm/sewer inlets before effluent entered the pumping station. The bulkhead gates had to be designed so that they would operate in both directions. The two (2) gates were inter-changeable in three (3) separate slots, thus, requiring each gate to work in 6 unique configurations. The project was completed within budget and on schedule. Johnson Machine Works provided technical advice during installation and initial operation of the gates. 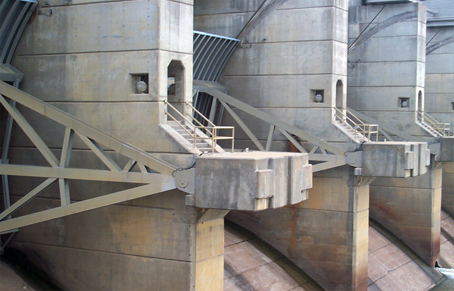 Johnson Machine Works was awarded the contract for the eight (8) auxiliary spillway tainter gates by Granite Construction in July 2000. Work was completed in late 2002. The tainter gates were 49’ wide, 43’ radius, and 46’-9 arc lengths and weighed about 92 tons each. The gates were hydraulically operated from below requiring special lifting brackets and trusses running between the arms. The gates were fully assembled outside representing the final erected position so all components could be assembled and checked. 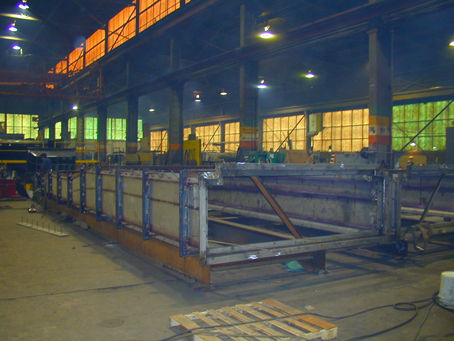 Johnson Machine Works was awarded the contract for fabrication and delivery of two (2) bulkhead gates and guides by Whitaker Contractors of California on June 29, 2005. Work was completed in March, 2006. The gates were of steel construction 8’-7” x 13’-10” and weighed approximately 4,500 lbs. each. The associated guide frames were fabricated from stainless steel and weighed approx. 7,500 lbs. each. The project was completed ahead of schedule. 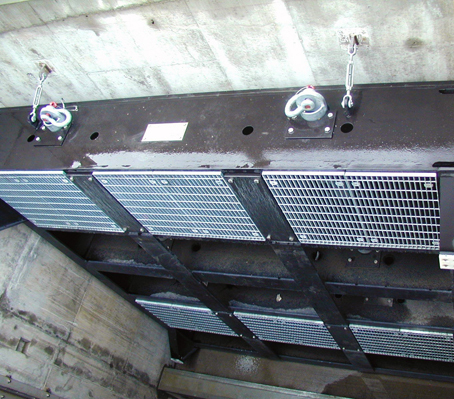 Johnson Machine Works was awarded the fabrication of five (5) spillway tainter gates by Wynn Construction Company in June 1999. Work was completed in October 2002. The tainter gates were 50’ wide, 35’ radius, 38’ arc length and weighed about 60 tons each. The arms had dihedral angles and the gates were operated by wire rope hoist. The gates were fully assembled in our shop in a cradle so all items could be checked. A 600-foot, 1,700-ton section of the new Milton-Madison Bridge is rising next to the shoreline in Milton, Ky. The span is part of the new US 421 bridge over the Ohio River connecting Milton, Ky., and Madison, Ind. Crews are currently preassembling the new truss bridge on barges just west of the existing bridge. Once done, the span will be floated a short distance upstream. Special jacks will lift the entire section into place onto temporary towers, which are being built immediately downstream of the existing bridge. A second 727-foot section of span will be built and “lifted” in a similar manner. The remainder of the truss will be erected on top of the temporary towers using cranes.